Fear. In short, fear is the ability to recognize danger leading to an urge to confront it or flee from it. That is how Wikipedia sums it up. One word, so small, yet so powerful. I guess fear is different for all of us. I guess it’s perfectly understandable for a girl from a small town in New Jersey to be afraid of a little Oklahoma storm. I am trying really hard to get over it. Really, I am. I feel blessed that I have always found shelter that has provided me safety and security. What I didn’t expect was that every crack of thunder and every flash of lightening would begin to completely freak me out. I was never afraid of storms before. I loved them. I have blogged about this before. They always offered me a calm, relaxing place to visit in the middle of the busy of life. It was an excuse to stay home, curl up on the couch and listen to the rain. Tonight, I decided to go for a run. As soon as I left the house, I looked up and saw lightening close by. Tonight, I was able to confront my fear and flee it at the same time. The approaching storm became my own personal trainer and hills I could only walk up 2 days ago became easy enough to run up tonight. I admit I was scared but I knew I had to make it around the block. It was my own personal challenge. As soon as my house came into my line of vision, I walked. I turned around, took one more look at that lightening and confronted it. I know it sounds crazy, but when you pass through a town a few miles away that has been destroyed, it takes a little piece of your heart. Every trip, every sight of such devastation rips at your heart. You can’t stop it, it just happens. To know these people are in tents while I am safely in my shelter as that tornado warning goes off leaves one feeling guilty and sick inside and scared. I was fortunate enough to go to the Healing in the Heartland concert last night. The emotion and the energy in that arena filled me up. So many emotions, so much pain enveloped in love and hope. We just need a break here. Too many sirens in too few days. Fear, real or imagined, reminds us we are only human. Sometimes we need to be patient with ourselves and just let fear pass on through. Acknowledge it, then continue on. It doesn’t have to be crippling, but we can’t deny it’s there. So tonight, I acknowledge it, and hopefully tomorrow when I begin the day, it won’t have the same power over me. Acknowledge it and let it go until it doesn’t exist anymore. Something to look forward to. That is my new plan for feeling excited and alive. So many times we get caught up in the monotonous tasks of every day life. I vowed, at least for me, this year would be different. Perhaps that is The Secret everyone keeps talking about. Having this vision board to keep you focused then a plan to follow up achieving those dreams. I just finished booking my plane ticket to fly back and see family. 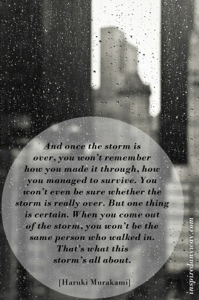 I can tell you this, at the base of the aftermath of a big storm lies perspective. If you dig down deep enough in the rumble, you can find yourself there vulnerable and honest. You find photos of all the people and events that really matter and after wiping the dust from the debris from your eyes, you find the clear focus that has been clouded up with what we think life is supposed to be. In the end it is memories, and special times with the people we love that matter most. So, I plan on making a trip to visit those people who mean the world to me. We never know when it will be the last time for us. The last time to see a person we love, the last time we are well enough to visit a place we love. Time is ticking all around us and we have to find a way to make the minutes count. Sometimes, we come to a point in our lives when everything catches up. It is in this moment that we feel weighed down with fatigue and inspiration gets snuffed out. That is a signal in this house to jump in the car and take an hour drive for some good old fashioned therapy in nature. That is exactly what we did today. There is something very rewarding in climbing a difficult path to the top of a small mountain. With every step, I could not deny how similar this climb is to a difficult situation in life. One foot in front of the other they say. Well, I guess they’re right. It was hot and tiring and believe me there were times I wanted to just turn around and start back down the path. But, I dug down deep and walked a little faster with a little more focus and once I got to the top…. 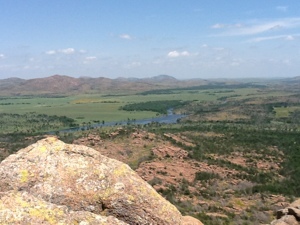 As I sat there on the highest rock I could safely climb to, I thought about some of my lessons from yoga. I felt the wind blow through me as I rooted down onto the rock. The wind was fierce today, but I felt solid as I sat there taking in the beautiful view. I thought about how long and difficult this past week has been. I was also reminded that if you fight your way through the difficult paths, the view at the top will be worth the struggle. So, that is the lesson here for me today. Let the things that don’t serve your higher purpose blow through. Don’t hold onto them, let them go. Leave room for all the positive, inspiring things and feel the weight of the world lift as you let the rest just blow away. There is nothing more powerful that sitting at the top of world, surrounded by the beauty that is always around us. Sometimes, we just have to climb high enough to see it. Today, I started my morning at my usual yoga studio. This day though, and this yoga class would be one that I would never forget. 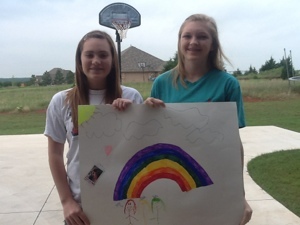 It was supposed to be a class of healing and a fundraiser for all the victims of the Moore tornado. We had a guest of honor. One of the teachers from Plaza Towers was there to share our class and tell her story. I sat there hanging on every word. My heart was breaking as I imagined the fear and pretend courage that engulfed her in a time that must have seemed endless. She was shaken but not broken. Her gentle spirit and amazing words touched each and every one of us in that room today. You, like myself are probably wondering how does someone get through a situation like that? Well, she told us. It was God and prayer. She explained how the media painted a grim picture of hopelessness and despair. For those people, both staff and students that walked out of that school that day, believed it was nothing short of a miracle. The hand of God. Her words keep repeating over and over again in my mind, “When we got outside and saw the school we knew no-one should have gotten out of there alive”. That is how she put it. She is touched and moved to tears over the support and love pouring into her small community. We finally took a ride through Moore today. I feel drained and heartbroken, speechless, and empty. I just kept saying Oh My God! The devastation is enough to cause physical pain to your very core. My heart hurts is not just a saying to me anymore. The heaviness I feel in my chest is crushing my breath. Its like the darkness that creeps over you in a moment of dread. I knew it would be hard to see, but what I didn’t realize was how deeply it would affect me. I saw a piece of a room with a picture still hanging and the rest of the house crumbled to the ground. I saw people standing in the middle of that rubble leafing through the mess that was once their home. I saw flags flying in piles of destruction and signs that read For Sale. Recently Remodeled. How will they rebuild? Where do you start when everywhere in your line of vision is a complete disaster? I am moved beyond words. There just are no words to explain what I saw today. The visions will haunt me for a long time. My heart goes out to that town. There were graduations today and funerals. There were clean up crews and volunteers ready to provide food and water. FEMA, Red Cross, Salvation Army and church parking lots filled with tents offering different services. Patriot Riders standing guard outside churches and teens holding signs offering hugs. What a sight, both sad and inspiring and touching on so many levels all at the same time. I am glad I took that difficult ride today. I needed to see it. It reminds me to hit my knees at the end of the day as I think of all the things I am grateful for. It reminds me that life is not guaranteed, time is not guaranteed, and that material things cannot define us. It is a lesson I will never forget. I thought it was worth sharing. Today, I dropped my daughter off at middle school for the last time. Usually, I am in a hurry to fight my way through traffic and rush on to the the next stop. But, this day, I pulled my car over and took a moment to watch her walk inside. As the tears came streaming down my face, I had a flashback to the first day I held her hand and walked her into kindergarten. She was so big that day and so brave. But today, as she jumped out of the car with a plasterboard size card for her favorite teacher, she looked so grown up. When did it happen? Where did the time go? All the struggles, joys, lessons, and memories came rushing back all at once. My little girl was growing up right before my very eyes. I can’t help but keep returning to a mental image of her sitting on the bench so I could snap a photo of her on her first day of school. As she walked to her classroom she didn’t look back. Today, she didn’t look back either. It warms my heart to know we have given her the confidence to fly on her own. I know that little girl is still inside of her, but for me, she seems so far away. It’s like a blur of years that have blown by so quickly with the winds of change. It is one of my moments. A new mental picture that will haunt my mind the last day she walks out of this house, her last day of high school. Today is such a mix of emotions for me. There are funerals going on for children that won’t have a next day or next year of school. My heart aches as those families bury their young children. I watch the amazing stories of how surviving children and their families are reaching out to help families who lost a child in that school on that haunting day. The stories are beautiful and they touch me deeply. I have not had the best luck when it comes to teachers the last few years. I even admit that most have been uninspiring and turned my kids off on the whole idea of sitting in a boring classroom. This year however was a little bit different. Last night my daughter stayed up very late. She has been talking about doing something special for a particular teacher. I suggested buying her a gift but she had her own idea. She got a giant poster board and made her a card. She used her poloroid camera for me to capture silly pictures of her that she attached. What was the difference? What was it about this teacher that made Kayleigh excited enough at the lazy age of 14 to make this teacher a card. I can’t get her to do anything willingly. I will tell you. This teacher won Teacher of the Year. Big deal I thought. What did that mean. In our lives, it meant that my daughter would be excited about school. She would be so excited that she would actually go out of her way to make conversation with me that didn’t involve eye rolling. This teacher did more than your average teacher. One of the assignments was on the Civil War. Instead of making them write a paper, she gave them the opportunity to participate in History Idol. Yes, these kids were able to write their own song to a popular tune and present it in groups in front of the class. They had the option to video tape themselves or perform it live. My daughter, dreaming of becoming the next Americal Idol, chose to do hers live. It was fun, informative, creative, and might I add very, very good. I was amazed. In hind sight, I wonder if a written paper would ever compare. My message to teachers is this, be a stand out. Be different. Use all kinds of unique ways to get these kids involved and help inspire them. In the car earlier this week Kayleigh said something pretty amazing. ” Mom, I think I might want to become a social studies teacher. I don’t like kids much, so I think I want to focus on middle school age. They are the really cool kids”. Will she become a Social Studies teacher? I have no idea. But the fact that she has given it some thought, speaks volumes about how much this wonderful teacher has placed a small spark inside her soul. I sent that teacher a note today to thank her. I pray my kids sit in more classes in the future that affect them the way this one did. I am very grateful! These words hold so much truth…..